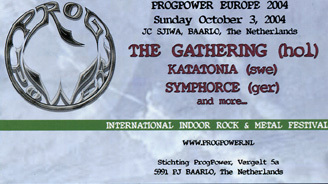 a review of ProgPower2004, day one can be found here. Only caught the last few songs of their set, which I found to be a bit disappointing in comparison with their performance at PP2001. I didn't really enjoy the new vocalist at all (who isn't the one from the latest album - whom I also didn't like much), and their recent material has more death vocals than the previous two albums. Tim who sang on the previous records appears to be concentrating on guitar these days, and while I enjoy his fluid shredding style, it wasn't enough to save the performance for me. the older stuff had a lot more harmony going on, and of the songs I heard in their set, the older ones were better. Into Eternity are an Canadian band on Century Media records and though their current album has certainly raised their profile in Europe, their style, which is a mix between Death Metal and Progressive Metal, is not one that really appeals and though I could see that they were a very competent band, they were really not my thing at all. Filling in for one of the bands which dropped out, fairly late in the day, they played first as they also had to perform 60 km away in Arnhem, that evening. They were also a little unfortunate with the mix, but I watched the last couple of tunes and the crowd seemed to like them. What a way to start the second day. A late replacement for Swedish band Amaran, Canadian tribe Into Eternity should have been far higher on the bill but were already due to play another gig in Holland that evening. As a result the hall was pretty well packed as they hit the stage running just after 1pm with a full frontal assault on the senses. With a sort of progressive melodic death metal, I enjoyed them much more than I expected - especially the technical playing and the way the various members all swapped the vocal duties, giving a nice mixture of clean and grunts. This is clearly a band that knows how to work a crowd. They had a great, amiable stage presence and played their music to a high level. 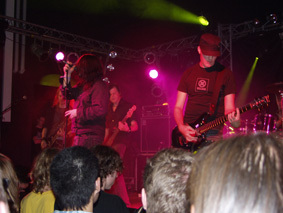 New song Paralysed was among the heaviest and they closed with Shallow, receiving a tremendous reception. Another surprise. I hadn't heard these guys before, but it was fairly solid melodic/power metal. the singer was very good, and the band seems to have concentrated on writing good songs rather than on instrumental virtuosity. Some of their songs had me tapping my foot, and for a start so early in the day, they got a decent crowd response. It's always nice to be able to say, with a huge, smug grim, ‘I told you so’. The band formerly known as Morgana-X, only released their demo CD last year and received a big thumbs up from me. As did their performance when I caught them on stage shortly afterwards. At the end of a 50-minute set here, everyone I spoke to was in total agreement – this is one hell of a good band. Mixing ProgMetal (think Pain Of Salvation and Enchant) with PopRock (think Marvelous3), Morgana-X has created something refreshingly new in a sound that has great crossover potential. Playing all four songs from the demo plus six newer numbers - they in effect showcased the whole of their debut album Tales From The Soul which is due for a world-wide release on Sensory early next year. (Samples are already available from their web site at www.novact.nl) The newer songs came over as heavier but still with that innate melody that shines through all Novact songs, but it's Eternal Life that remains my favorite. 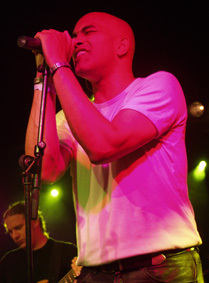 The centre of attention is frontman Eddy Borremans - mixing a bit of soul, with plenty of power and emotion, he again put in a really confident, high-energy performance that helped win the band many new admirers. For a band still without an album to plug, they received a great response. At the risk of being boring, I'll come to the same conclusion as last time – the debut album can't come soon enough. As Andy had been going on about these guys for some time I was really curious if they could live up to to the expectations he created. I can be short about that: yes they did. With a firm set list and professional act this band showed that no big theatrical moves or words are necessary to get the audience involved. Hope to see more of these fellows in the future, they certainly deserve the extra attention. 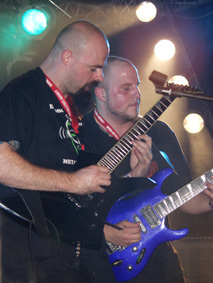 Previously known as Morgana-X, Novact were a very professional, polished Prog Metal 5-piece. 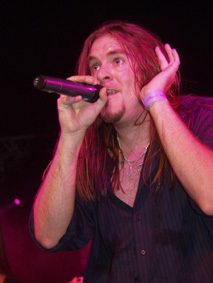 Their music was very melodic and along with their excellent front man, it helped the band connect very quickly with the audience. I hadn't heard them before, but they certainly won me over. I was unable to grab a copy of their demo disk, but they hope to have their first album released really in 2005. It will be one that I will look out for. After playing for what seemed like an eternity, the singer announced they'd finished three songs. I couldn't really tell when one finished and another started to be honest, and after another 10 minutes (I'm sure the fourth track still hadn't ended) it was time for pizza. their performance seemed competent enough, I just found their stuff boring to listen to. Tomorrow's Eve got off to a bad start, when they came on stage and began playing only to find that just the drums could be heard. Eventually the sound desk, found the right controls and the other instruments sprang to life, although I felt that the opportunity for the band to make an immediate impact had been somewhat lost. Nevertheless they ploughed on regardless and perhaps for too long before introducing themselves to the crowd. It must have taken them 20 minutes to play their first 3 tunes and when the vocalist announced that as time was short they would carry on with the remaining 5 or 6 tracks of their current album, the idea of an early dinner break suddenly seemed very attractive. Having enjoyed this German band's latest offering, I was quietly looking forward to their set. Mirror Of Creation was a decent slice of extended, riff-heavy European-style progressive power metal but from the start of their show, when only the drums could be heard, it just didn't work for the band today. I seem to be saying this a lot – but the vocals of Rouven Bitz were way off the mark throughout the set. He worked the stage well, but the strained tones just distracted too much from what the rest of the band was doing. They couldn't be criticized for not putting in 100% but it just didn't work for me at all. Highlight of the weekend, and they got by far the best reception of any of the acts that I saw. with a mix of sound somewhere between Anathema, Porcupine Tree and english neo-prog, bolstered by a heavier sound than they have on disc, they put on a fantastic performance. The highlight for me was the guitar player, just about everything he did sounded great. 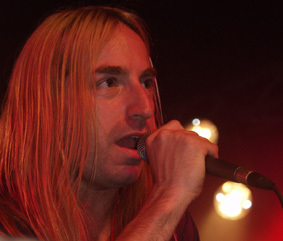 The rest of the band provided a very firm base for him to create a lot of the melodies of the songs. A large part of the set was instrumental, but there was a certain atmosphere that they managed to create that kept the audience transfixed. The recently formed Polish band Riverside, were definitely one of the most highly anticipated acts of the day – and with good reason. Their debut album is out now on Sensory Records and has brought them a lot of attention in ‘Prog’ circles. Certainly one can hear elements of bands such as Anathema, Porcupine Tree and maybe even Opeth in their sound, but it was Marillion that played a part in bringing together the two founder members of the group and on stage, their Neo-Prog roots shone through. In fact for a band from Poland, at times they sounded remarkably English in the way that the likes of Jadis or Pendragon do. For a debut performance outside of their homeland, it was an extremely polished and professional show. Lovely harmonic bass playing and a fantastic melodic guitarist were matched with an equally adept drummer and a keyboard player who could slot in nicely into another English neo-Prog band you could think of. Playing all of the material from their 40 minute plus album Out of Myself left them room for another 20 minutes or so of new songs or improvisations. Whatever, it all flowed beautiful and kept the crowd enthralled until the very end of the show. As the musicians left the stage one by one, each was greeted by a huge roar of appreciation from the crowd, and the feeling was that we had all witnessed a particularly special performance. 2 minutes later and the band's entire stock of CDs had sold out. Band of the Weekend, without a shadow of a doubt. Spellbinding, magical, captivating, and Professional with a capital P. Those are the sort of words that were bursting out of everyone's mouth after this new Polish band provided the best musical hour of the whole weekend. They'd never played outside of their homeland and their debut album Out Of Myself had only just been released. A mixture of Anathema, Porcupine Tree and any host of British Neo-Prog bands, Riverside delivers guitar-based, dark progressive rock with a frequently heavy edge. 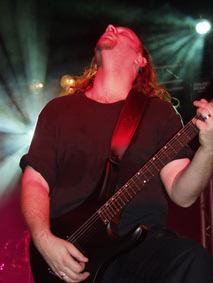 While the whole band is exemplary, guitarist Piotr Grudzinski stands out for saying more with a few notes than most other guitarists had managed in a whole set. For such a new band, their professionalism too had to be admired. They sure left the stage in style. 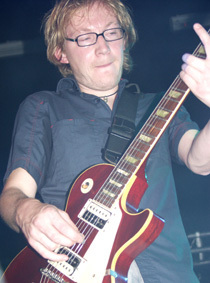 First the guitarist took over the leading role, bowed his head, put down his guitar, and left the stage. Then the bassist/vocalist took over the leading role, bowed his head, laid down his bass, and left the stage. Next up it was the drummer and finally the keyboardist was the last one to play his role and depart. Within five minutes of their set ending, they'd sold every available copy of their album. The ProgPower organisers have a rule that they never have a band on the bill two years running. Well every rule is there to be broken and Riverside just have to return next year when everyone will have had the chance to hear their music beforehand. ‘Surprise of the Festival’, ‘Band of the Weekend’, ‘Most Promising Newcomer’, ‘Album of the Year’ – whatever label you want to give Riverside it won't be an exaggeration. Absolutely awesome. And then finally the band that I came to see: Riverside. Their album really knocked me off my feet. In none of the comments of the other reviewers you'll find that I have been telling them that Riverside would become the band of the festival, they all say that now, but I told them saturday at the start of ProgPower. I even made sure we would start the diner break early so we would not be waiting for a pizza during the first notes of Riverside (Baarlo's pizza places tend to be a bit crowded during a ProgPower diner break). So we arrived nicely on time to witness what was indeed a splendid performance that even beat the high expectation I had. I can can only concur with all the descriptions above. The end of the show send a shiver down my spine: walking off the podium one by one, what a splendid way to end a splendid performance. Afterwards I spoke to some of the band members and they told me, this being their first performance out of Poland and all, they were pretty nervous. I really did not notice that, quite the contrary: Mariusz starting Out Of Myself by whispering"Voices in my head" over and over until finally the band started backing him: a pretty gutsy move. A decent performance, although the songs seemed somewhat more upbeat than they do on CD. For example, "evidence" from their latest CD is a great song, which they performed mid-way through their set, came across as less doleful and a bit catchier. Katatonia are not the most energetic band and their stage presence seemed a bit static. Good, but not great. Last year it was Italian drudge merchants Novembre who sent me off to eat after a couple of songs - this time it was Katatonia. A metal version of The Cure or The Smiths – this really isn't my sort of thing. The vocalist seemed to spend as much time looking at his feet as at the crowd and I struggled to make out much of a song or melody among the droning guitars and droll vocals. As I departed, other than a few faithful at the front, they didn't seem to be doing much for many others either. I'm sure it works for some but the local pizza house was a far more interesting proposition for me. Katatonia are one of those dark acts whose music is not the sort of thing that you should be listening to, when you are down in spirit. So after the high of Riverside, the Goth-tinged dark atmospheric metal of these Swedes gradually brought us down to earth again. They are probably not one of the first bands that you might think of to play at a festival called ‘ProgPower’, but there was clearly a good proportion of the crowd who enjoyed them and while they did not play made tunes that I particularly enjoyed, they put on a decent show. When they were good, they were great. Several times they totally lost me when they went off into trippy post-rock territory. Unfortunately no Strange machines, though we did get treated to Confusion from Nighttime Birds, and Eleanor from Mandylion, those two songs being the highlights for me. Anneke sounded great as always, and seems to have developed a stronger stage confidence than that from the live DVD. While the set-list was hardly a selection of my personal favourite The Gathering songs, I did enjoy the songs that I recognised, and somewhat bizarrely it seemed to fit into the overall ProgPower package quite well. 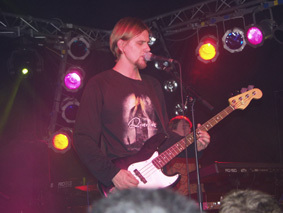 The day was brought to a close by one of the best known names on the Dutch rock scene, The Gathering. Though their output these days is a million miles away from their Death-Metal beginnings, their music, which they themselves describe, as ‘trip-rock’ is, in some ways, not a million miles away from some of the proggy improvised music of the 1970s. They played a set that was very similar in make up to the one that I saw them play in London, in 2003, consisting mainly of material from their last 3 studio albums, with only Eleanor representing the excellent Mandylion. Front woman Anneke van Giersbergen is now around 4 or 5 months pregnant and though she occasionally has to rush off stage, she is soon back again with a beaming smile for her adoring fans. Her voice is in fine shape throughout and if she chose to sing the Dutch telephone directory, I'd still go out and buy it, so the lady can do no wrong for me tonight. Her cohorts of the Rutten brothers, Frank Boeijen on keyboards and new bassist Marjolein Kooijman build a super soundscape utilizing samplers, drum machines and theramins in addition to the more standard instruments, with Anneke helping out on guitar for a couple of songs. It's a nice collection of songs, but, perhaps because they started late, the set seemed a little on the short side. All the same I was grateful for the chance to see the band before they take an extended break. All in all, the second day could be considered a huge success. The sound was pretty good for most of the day and the bands on stage turned in some great performances. I expect that I will be back again, next year! I was really hoping The Gathering would have many older tracks on their setlist. First because I am not too familiar with their current work and second because I think a setlist containing Strange Machines and a number of heavier songs from their first 3 albums would have done much better with the Progpowe audience. That is not to say that this was not a good performance, The Gathering is a top notch band and I doubt they have it in them to do a mediocre performance. But this setlist was not the most optimal one for this audience, me thinks. I did not reckognise all of the songs but did realize half way through that I was not only admiring their musicianship but in fact really enjoying myself. A very good (but different) closing of another splendid ProgPower weekend. This well-established Dutch band was probably the best known act on the festival posters and so they were duly charged with bringing proceedings to a close. I'd heard plenty of praise for this act but having only given their Souvenirs album a cursory listen, I didn't know really what to expect. Apparently the set was taken almost exclusively from their last three albums and it all sounded very much like the progressive, improvised music from the 70s I've got hidden away somewhere in my collection. It was all very well executed and professionally done but I just felt there was a lack of character, personality and crowd interaction coming from the stage. All very nice to listen to, but that's only 50 per cent of a live show for me. 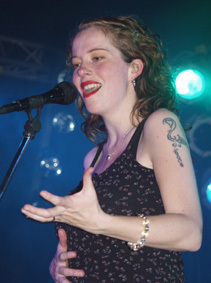 Front woman Anneke van Giersbergen looked around five months pregnant and though she occasionally departed off stage she did more than enough to prove that she has a quite stunning voice. I enjoyed it, but there was nothing that made me want to go out and buy any of their albums and rather than go out with a bang, it meant this year's festival closed with a bit of a gentle stroll – albeit a pleasant one. Having completed my third year of journeying to the south eastern corner of Holland, for the first time it was good to see that I wasn't the only Brit. Several groups made it across from the UK along with fans from Sweden, Denmark, France, Germany, Belgium, Spain and even Hong Kong. Everyone I spoke to agreed this is a truly great and unique international festival. The organisers must be congratulated for pulling together a bill that mixed in music from all corners of the Prog, Power and Gothic Metal spectrum with a clever mix of names you know, names you don't and names you never expected to be able to see live. After the end of the weekend, organisers declared this the most successful event ever. There were no egos. Almost every band was hanging around outside and happy to chat and sign stuff. The sound, while still not perfect, was a huge improvement on last year. This year Riverside was the runaway top act along with NovAct and Devin Townsend and All Too Human getting an honourable mention for The Jester. Tickets for both days (that's 12 bands) cost just 40 Euros. If you're fed up with the rip-off prices, over-inflated egos and crap facilities of the big festivals and want to try something a bit more intimate then I'd heartily recommend a trip to Baarlo next October! Again, like last year, a weekend well spend. You can have a couple of beers, meet people with the same musical interest from all over the world and even chat with some of the band members. But most of all you can enjoy a good mix of familiar bands and new bands. Last year the sound lessened the ProgPower experience, while this year it was ok. Still not perfect but if it hadn't been for last year we would not even have mentioned the sound. My family has already been informed that they will not be seeing a lot of me during next years ProgPower weekend, hope to meet some of you there!